1-2 Amphiplecta cf. acrostoma Haeckel; 1, cephalis closed at top, VS-R-60b, 3-5cm, Y34/1, 350x; 2, right lateral view, cephalis open at top, VS-R-60a, 3-5cm, T9/1, 300x. 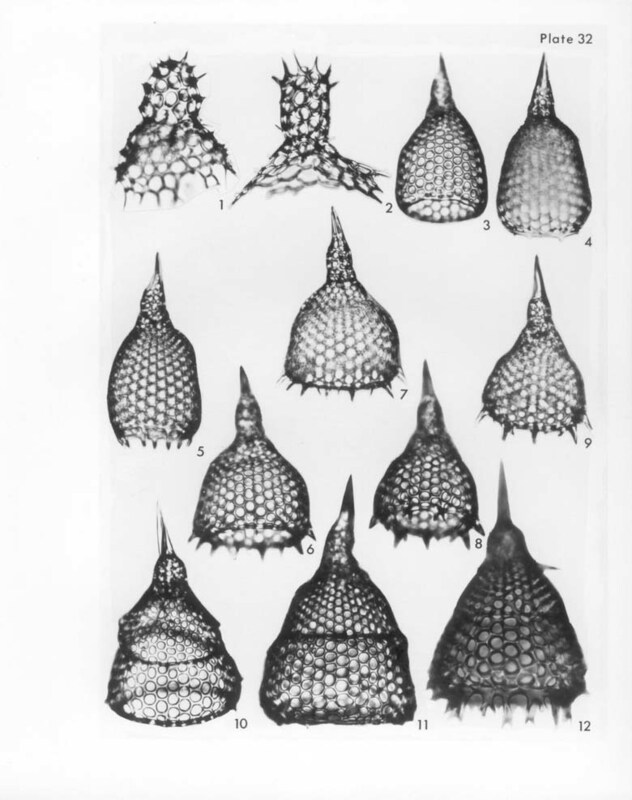 3-5 Anthocyrtium oxycephalis (Haeckel); 3, dorso-left lateral view, terminal spines lacking, VS-R-60b, 3-5cm, J44/2, 300x; 4, dorso-right lateral view, focus on cephalis, VS-R-71a, 1-3cm, X24/0, 300x; 5, left lateral view, VS-R-60b, 3-5cm, R18/4, 300x. 6-9 Anthocyrtidium cineraria Haeckel; 6, ventral view, focus on thorax, VS-R-60b, 3-5cm, F13/3, 300x; 7, same as fig. 6, focus on cephalis, 300x; 8, left latero-dorsal view, focus on thorax and terminal and subterminal spines, VS-R-60b, 3-5cm, F12/4, 300x; 9, same as fig. 8, focus on cephalis, 300x. 10-12 Lamprocyclas maritalis Haeckel; 10, dorso-right lateral view, terminal spines lacking, VS-R-71A, 1-3cm, C6/4, 300x; 11, dorsal view, terminal spines rudimentary, VS-R-91Bb, 1-3cm,U44/3, 300x; 12, right latero-dorsal view, terminal spines bifurcated distally, VS-R-56b, 1-3cm, P30/0, 300x.